A couple of days after the arrival of my 11" iPad Pro, Pixelmator Photo was released. I had a good look at this and I am quite impressed with the range of editing tools that this provides, although there are some examples of odd behaviour. In one of those nice coincidences that crop up from time to time, I had just ordered the 11" iPad Pro, because of its USB-C and camera connectivity potential, when a day or so later, I had an email from Pixelmator. 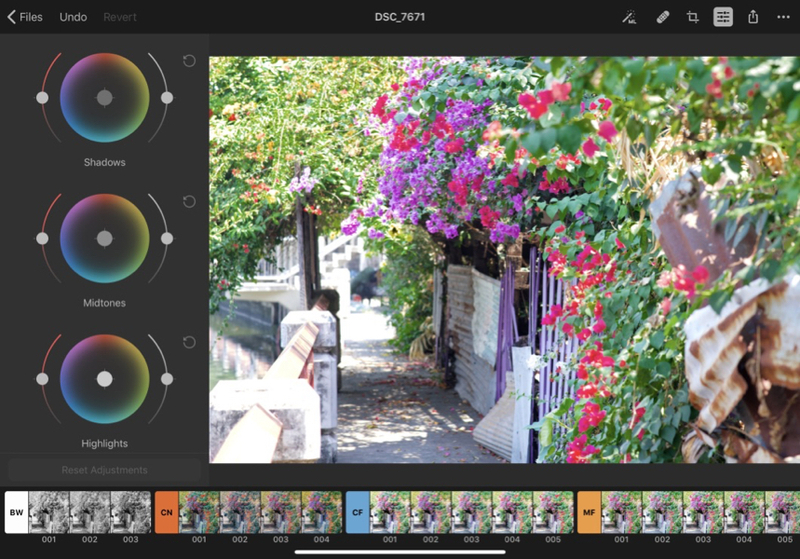 This detailed its new iPad-only Pixelmator Photo app. The video on the page, showing a view of the interface reminded me of Aperture. I had used that for years on the Mac. A quick look at the video was all I need to place my pre-order (139 baht) for a planned 9 April release. It is now shown as 179 baht ($4.99). The app was available late Monday here (8 April) and I had a quick look before bedtime. Although it is designed for the iPad, it will not work on all of these devices. It was downloaded automatically to my 9.7" 6th Generation iPad, but the download originally balked on the iPad Pro (although shown as available). After a restart, the app installed. I began on the 9.7" iPad, but had problems with the size of RAW images I use. When first opened a screen is shown with images available on the device: rather than access Photos, an image saved as a file can be opened. I can also access images in Photos using a + icon at top right of the screen. When an image is chosen, an Import option is shown. There is a small delay while the image is downloaded. On the 9.7" iPad a panel warned me that images of more than 31 Mega Pixels [not MB as I wrote initially] were not supported, although Darkroom had always coped. This happens every time, however, on the 9.7" iPad, even if the image is downloaded and opened first in Photos. On the iPad Pro, there were no such problems and all images I have tried thus far appeared with no problem. The purpose of Pixelmator Photo is editing. Several controls are shown at top right, with a line of filter options along the bottom of the screen. 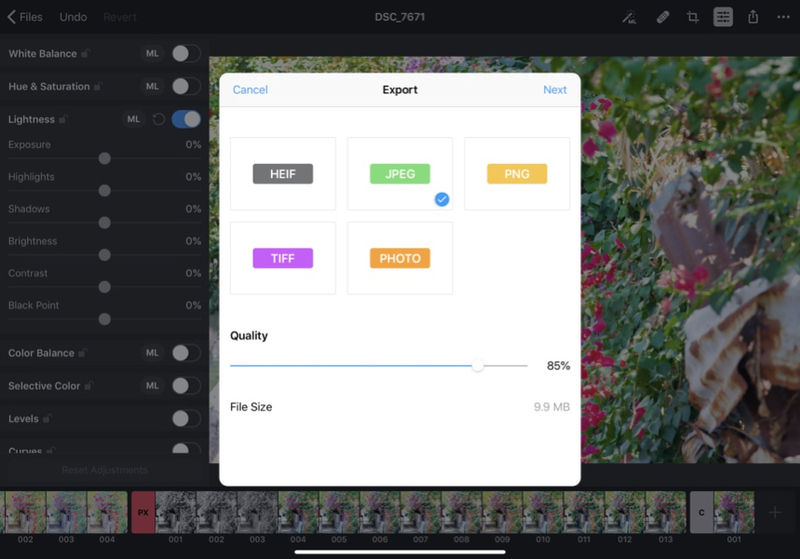 These filters are grouped into 9 sections: Black & White (3), Cinematic (4), Classic Films (5), Modern Films (6), Landscape (5), Vintage (5), Urban (4), Night (4), and Pixelmator Pro (13). There is also an (empty) C option that allows users to import their own image settings. Applying any filter can be reversed using an Undo item at top left of the screen (or Cmd + Z with a keyboard). As far as I have been able to discover, there is no way to hide these filters. That might be useful. 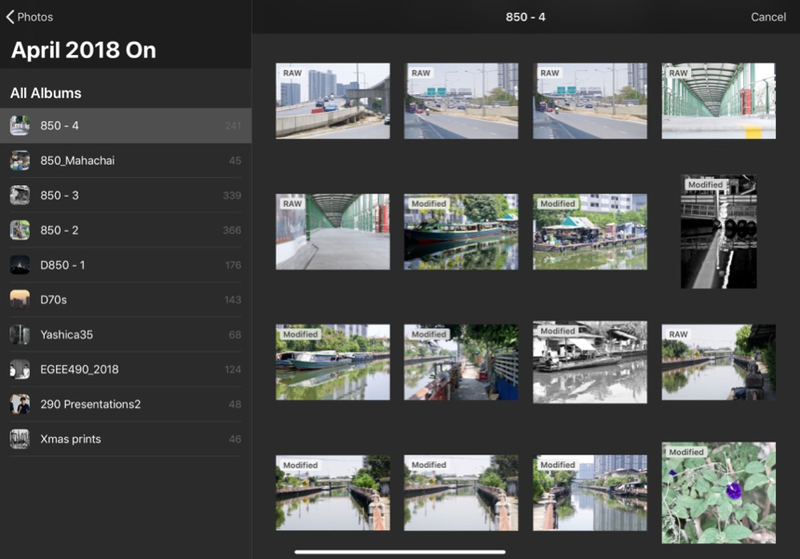 The editing tools are accessed using five icons (top right): ML, a "machine learning" enhance tool that will "automatically improve the color and light of a photo"; Repair; Crop, with rotate, mirror, straighten, and perspective; Edit; Export; and more, giving access to some display controls and Help. 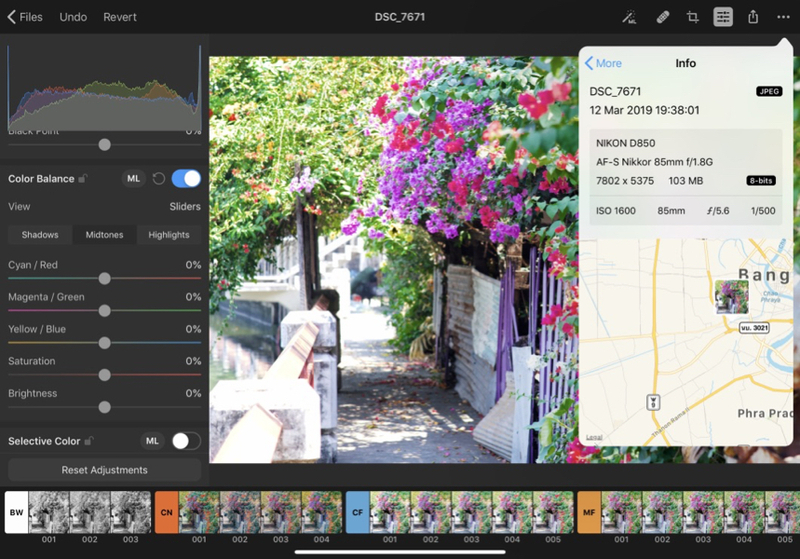 Apart from the useful tools within the Crop section, the most valuable part of the app is Edit. 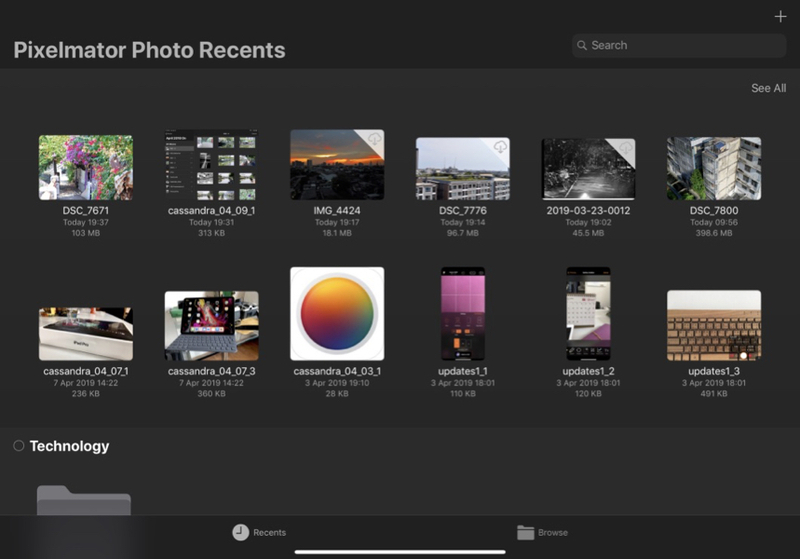 When this is used a top to bottom panel appears with a large number of editing features: more than Photos on the Mac, although fewer than Aperture to which I first compared the interface. By default, the panel is on the right of the screen, but can be easily dragged to the left. I did try the center but the panel slides back to the closest side (L or R). On the display of the 11" iPad Pro, this panel took up a fair amount of room, but there was no way to adjust its size, or the size of the text. I did try it with a couple of larger VGA monitors and while the image display and editing controls are nice to work with, I still felt that the text and panel could be slightly smaller. I did most of this with the iPad in landscape mode, but did have a look at portrait mode: not at all practical. At the top of the panel is a Histogram. This may be turned off in the display controls, but it is useful to see it change as adjustments are made. While some controls are normally ON by default, each option has a button that allows it it be turned OFF. When this is done, it is easy to see all 16 control options: White Balance, Hue & Saturation, Lightness, Color Balance, Selective Color, Levels, Curves, Replace Color, Black & white, Color Monochrome, Sepia, Fade, Channel Mixer, Invert, Sharpen, and Grain. Each of these editing options has a number of controls (depending on the feature) with a couple having interesting alternatives. 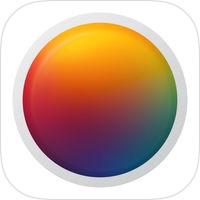 For example, Color Balance offers either Color Wheels - Master and 3-Way Color (Shadows, Midtones, Highlights) - or Sliders for Shadows, Midtones, Highlights: Cyan/Red, Magenta/Green, Yellow/Blue, Saturation, and Brightness. There is also a section marked Selective Color, which would be familiar to those who use Photos on the Mac, or Darkroom on iOS. Or Aperture. With Curves, Channel Mixer, Color Monochrome and Invert, there is an unusual amount of flexibility here, just with the color editing options. Although I turned off all of the controls while examining what was available, under normal use I would expect to have a few of my regular tools ready for use. These would include White Balance, Light Balance with a number of light-editing tools (Exposure, Shadows, et al), and Selective Color. I would turn on other tools as needed, but at this stage I am still in the process of discovery. There are more controls here than I would use on a regular basis. When a photo is edited, there are Export options, including Modify Original, Save a Copy, and Export. There are options here for HEIF, JPEG, PNG, TIFF and PHOTO. When HEIF or JPEG is selected the user has access to a quality slider underneath. The app displays the image size depending on file type. In that More menu, as well as those display options, there is also an Information option which displays some metadata from the image being edit, although not as much as was previously available in Aperture (EXIF, IPTC, et al). For Pro users it would be handy if more metadata were shown. 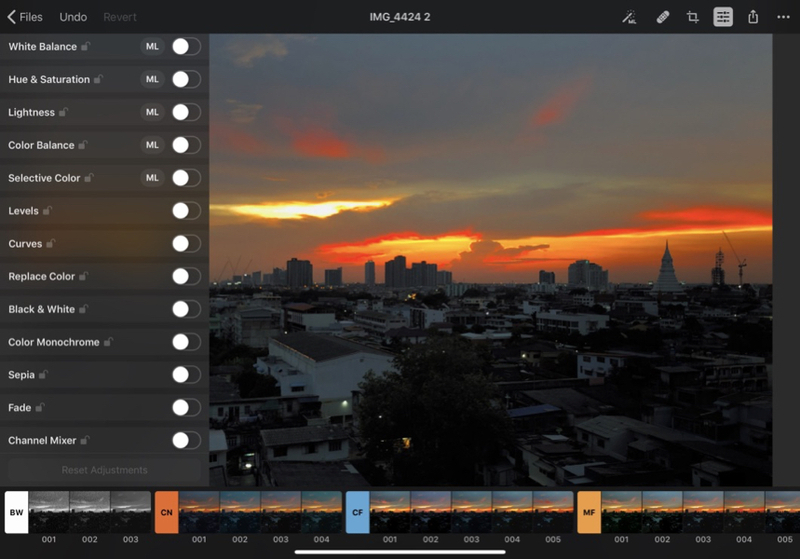 The developers have done some excellent work here and apart from some minor niggles (first version remember) this will almost certainly become my editor of choice, especially when I am using the iPad Pro. It is not available for the iPhone and with the rich number of tool options available this makes perfect sense. 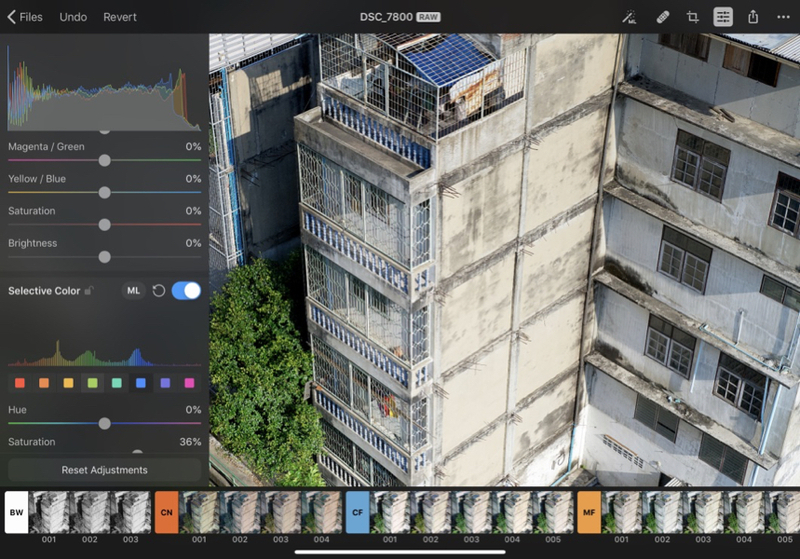 For the iPhone and for some quick editing of RAW images on the iPad, Darkroom will still be in my armory, but when more tools are needed, Pixelmator Photo makes a lot of sense. When Aperture first arrived it looked as if it had taken some of the best from applications like Capture One. 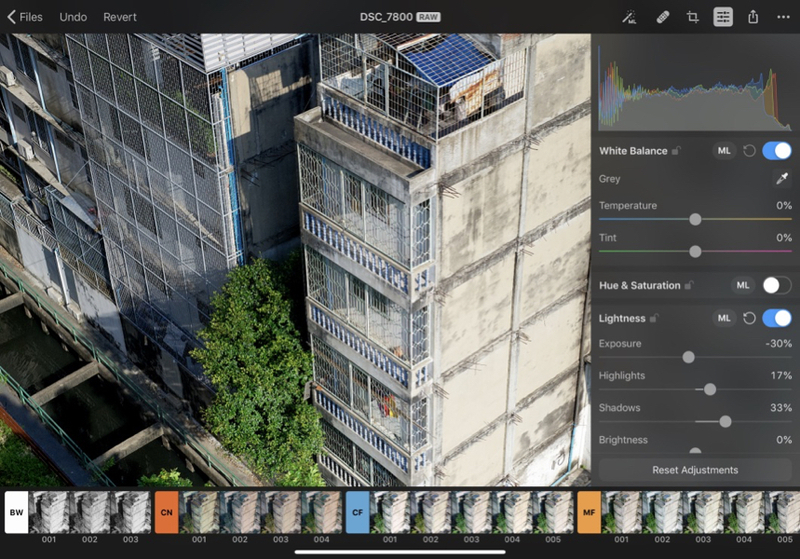 Pixelmator Photo feels like many of the good features of Aperture are now available for quality editing on iPads and is highly recommended.